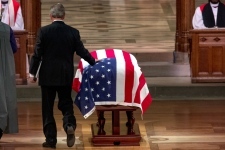 WASHINGTON -- The nation bid goodbye to George H.W. 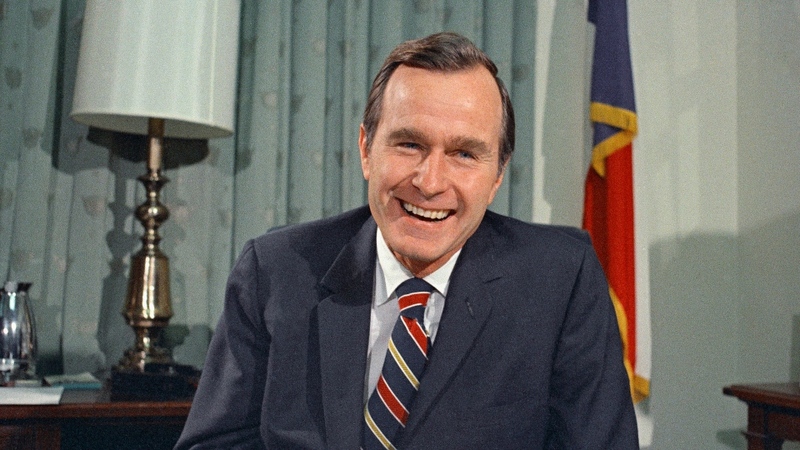 Bush with high praise, cannon salutes and gentle humour Wednesday, celebrating the life of the Texan who embraced a lifetime of service in Washington and was the last president to fight for the U.S. in wartime. 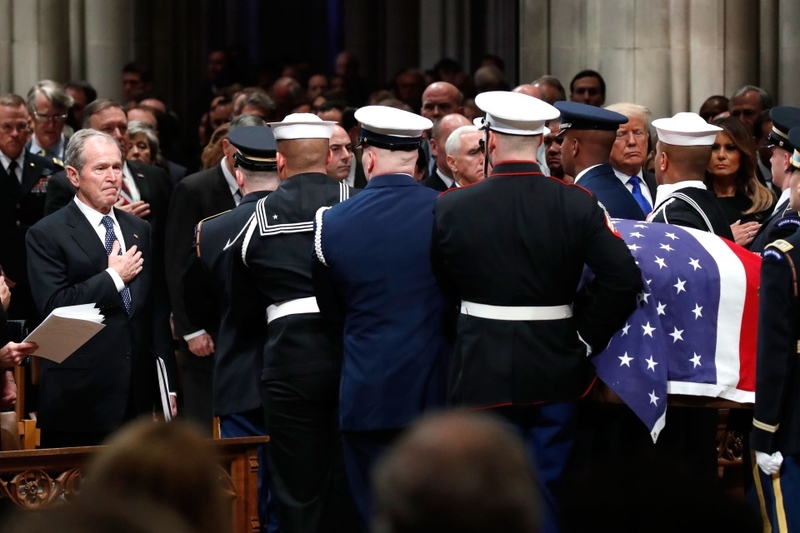 Three former presidents looked on at Washington National Cathedral as a fourth -- George W. Bush -- eulogized his dad as "the brightest of a thousand points of light." His plane, which often serves as Air Force One, arrived at Ellington Field outside Houston in late afternoon. As a motorcade subsequently carried Bush's remains to the family church, St. Martin's Episcopal, along a closed interstate, hundreds of people in stopped cars on the other side of the road, took pictures and shot cellphone video. One driver of a tanker truck climbed atop the hulking vehicle for a better view, and at least 15 firefighters scaled a pair of stopped firetrucks to salute. Meacham praised Bush's call to volunteerism, placing his "1,000 points of light" alongside Abraham Lincoln's call to honour "the better angels of our nature" in the American rhetorical canon. Meacham called those lines "companion verses in America's national hymn." Bill Clinton and Mrs. Obama smiled and chatted as music played. 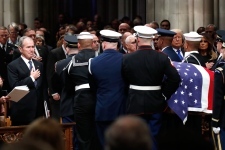 Carter was seated silently next to Hillary Clinton in the cavernous cathedral. Obama cracked up laughing at someone's quip. Vice-President Mike Pence shook Carter's hand. 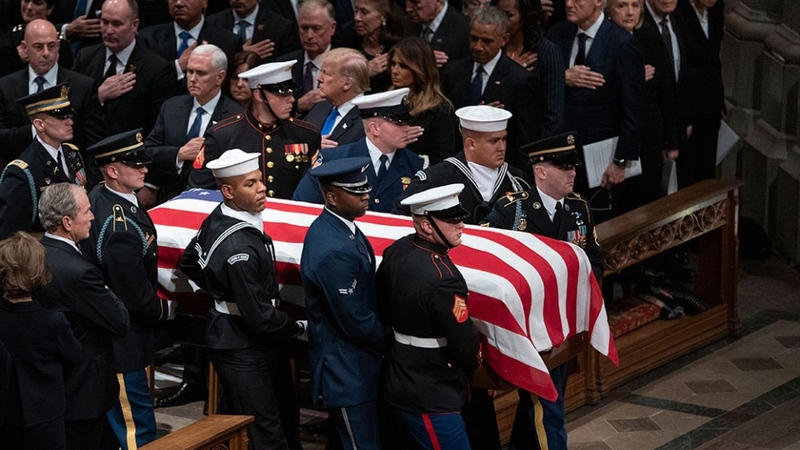 On Tuesday, soldiers, citizens in wheelchairs and long lines of others on foot wound through the Capitol Rotunda to view Bush's casket and honour a president whose legacy included a landmark law affirming the rights of the disabled. Former Sen. Bob Dole, a compatriot in war, peace and political struggle, steadied himself out of his wheelchair and saluted his old friend and one-time rival.